June 17, 2013 - Hamilton School District. Hamilton School Board members adopted a final budget that will be presented at the district’s July 15 Annual Meeting. The 2013-14 budget is $50.09 million, which is a 1.92 percent increase from the current year. The tax rate is expected to drop from this year’s rate of $10.40 to $10.30 per $1,000 of equalized property value. School officials recently learned that Waukesha County property values are expected to inch up slightly, which brings down the mill rate. In addition, the district expects to receive $21.1 million in state aid which is an increase of $647,834 from 2012-13. Summer Opportunities 2013 classes have not yet started, but the School Board approved 2014 dates so that they could be included in the 2013-14 Community Calendar. The 19-day program will be in session June 23-July 18, with July 4 off in celebration of the national holiday. 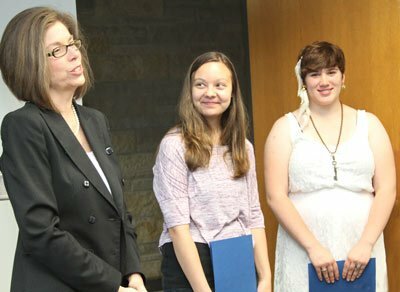 Hamilton School Board members recognized high school art students who were regional Scholastic Art Award recipients. Constance Dowden and Courtney Lehmann were on hand to receive their certificates from the School Board. (From left) Superintendent Kathleen Cooke, Ph.D., presented certificates to Constance Dowden and Courtney Lehmann. Hamilton art teachers Ellen Acuff and Pamela Mierow described the students’ accomplishment. In addition to winning a gold at the regional level, Dowden’s work went on to earn a gold medal at nationals, the first time in the school’s history. Others who were regional award-winners, but unable to attend the School Board meeting were: Maya Pechenova, Cassandra Metzger, Taylor Burns, Frances Weiss, Lindsey Paquette and Zachery Smith. Approved pay rate increases for: casual custodians, at 2 percent; driver education coordinator, 1.9 percent; summer school paraprofessional, 1.5 percent; and summer school substitute administrative assistant, 1 percent. The pay rate did not increase for all other non-group positions, including diagnostician, driver education teacher, fitness center assistant, hall monitors, substitute hall monitor, supervisor greeter, playground noon hour employee, food service substitute, hearing interpreter, program support, seasonal employees, summer school administrative assistant, and teacher substitutes.